While traditionally Jalapenos are used to add a spice factor to the dip, for a nice colour contrast I added red long chilli instead. To help lift the acidity of the dip and keep it green for longer, I also used baby cocktail onions instead of raw onion. Besides raw onion can leave you with bad breath, and I’m sure you don’t want that. As mentioned, you can omit the roasting / grilling step if you don’t have time, but I find that you can pre-heat the oven grill and roast them while getting all your ingredients ready. Preheat your oven grill to high (about 200C, 400F). Using the BBQ Dragon will get your coals nice and hot! Cut avocado in half and remove seed. Place halves, skin side down, on a roasting tray and grill for about 5 minutes. Remove from oven and set aside. Scoop roasted avocado into a bowl. Add lime juice, chopped chilli, coriander and onions. Mash around well using a spoon or mortar and pestle. 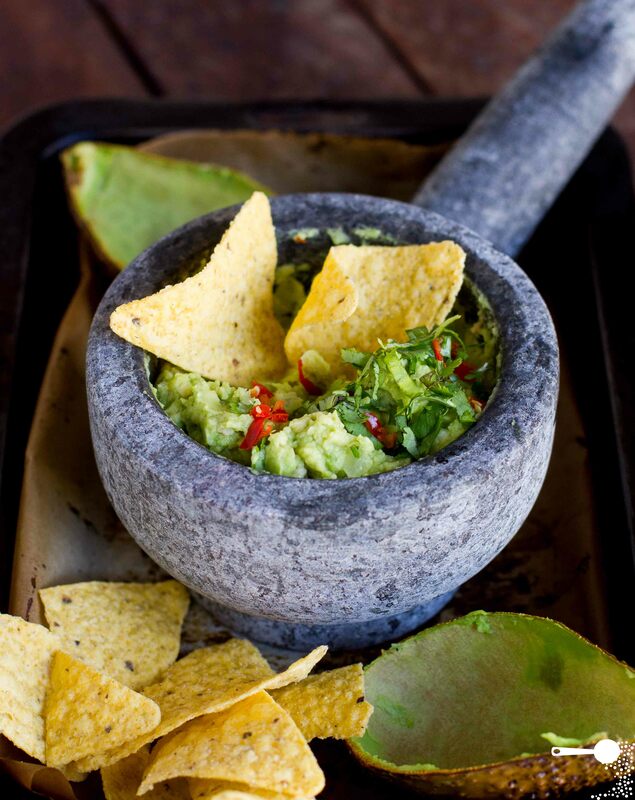 Serve Roasted Avocado Guacamole with a side of corn chips, slices of fresh baguette. Store in an airtight container in the fridge for 1-2 days and use on burgers and sandwiches.